Acoustruments, developed by Disney and Carnegie Mellon University (CMU), are plastic add-ons that use ultrasound signals emitted from the speaker of a phone and picked up by its microphone. 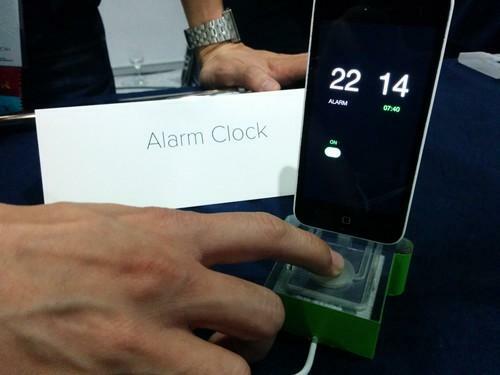 This example at CHI 2015 in Seoul controls an alarm clock app. If you miss the buttons on your old-school flip phone, researchers have developed a tactile sheath for smartphones that can open up the ways they are controlled. Acoustruments, developed by Disney Research and Carnegie Mellon University (CMU), are based on ultrasound signals emitted from the speaker of a phone and picked up by its microphone. They are being presented in a research paper this week and demoed at the CHI 2015 conference in Seoul, formally titled Human Factors in Computing Systems. By having the sound travel through a tube in the plastic sheath, and then pushing or otherwise deforming it, the sheath acts as a passive, analog input device that could be more convenient than a touchscreen in some situations. For instance, the sheath could be molded into a stand and serve as a control mechanism for an alarm clock app in a smartphone, according to the researchers. Another use could be a button that calls up a map while driving. The sheath can be formed into a U-shaped covering for the bottom of a smartphone or a full case, among various configurations. It can incorporate knobs, valves, rocker switches, pressure sensors and other input mechanisms. Interactive dolls, smart cases and toy cars, all based on ultrasound traveling through tubes in the plastic sheaths, are other examples of what's possible with the technology. "We are so limited in what we can do with touchscreens, but our hands are capable of so much else," said Gierad Luput, a graduate student at CMU's Human-Computer Interaction Institute. "With this you can use your hands naturally, and it creates a better user experience." The idea of using ultrasonic waves as a basis for a control device was inspired by wind instruments such as the slide whistle, often used for sound effects, said Eric Brockmeyer, a research associate at Disney Research. Acoustruments are simple, passive and powerless and are made from cheap injection-molded plastic parts that can be 3D-printed, they said. There's no plan yet to commercialize Acoustruments, but the technology could end up in Disney toys one day.